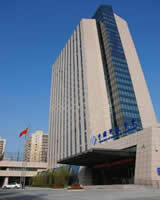 China Hall of Science & Technology Hotel Beijing (CHST) is located on the thriving Fuxing Road. On west Chang an Avenue, close to Diaoyutai State Guest Hotel and Yuyuantan Park, the hotel enjoys beautiful scenery and convenient transportation. China Hall of Science & Technology Hotel Beijing offers 220 guest rooms and suites which are very elegant, comfortable and fully equipped. The banquet hall is luxuriously decorated, and restaurants of varying sizes and different decorations serve various Chinese traditional delicious food such as Yue, Chuan, Lu, and western dishes. 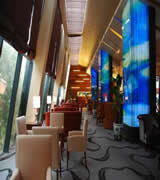 In addition, CHST provides foreign exchange, a business center and shopping, beauty salon, air tickets, etc. As a multi-functional and comprehensive building for scientific and technological activities, CHST holds domestic and international academic exchanges of science and technology as well as holding large and medium-sized meetings. It covers a space of 61,000 square meters with all the necessary fittings. 20 meeting rooms in different standards for holding meetings, releasing news, academic lectures, business negotiations, performances and showing films; A and the 1000-square meter multi-functional hall is perfect for scientific and technological exhibitions, new product fairs and friendly gatherings. Finally, guests with leisure time on their hands can enjoy drinks at the café, visit the beauty salon or take exercise at the fitness center. © Copyright ©2009-2017 WWW.CHINAHALLOFSCIENCEANDTECHNOLOGY.COM. All Rights Reserved.